Breitling’s longstanding dedication to accurately measuring flight times takes form in their newest timepiece the Chronoliner B04 – aptly nicknamed the “flight captain’s chronograph.” This signature chronometer allows the user to measure flight times while juggling timezones around the world. The Chonoliner features a Breitling Caliber B04 self-winding movement with 28,800 vibrations per hour and a 70-hour power reserve. For those who are constantly traveling the globe, the timepiece features a second timezone on the dial when in 24-hour mode, and a third timezone on the bezel. Additionally, this complex piece features 1/4 of a second chronograph, as well as a 30-minute totalizer, a 12-hour totalizers and a calendar. 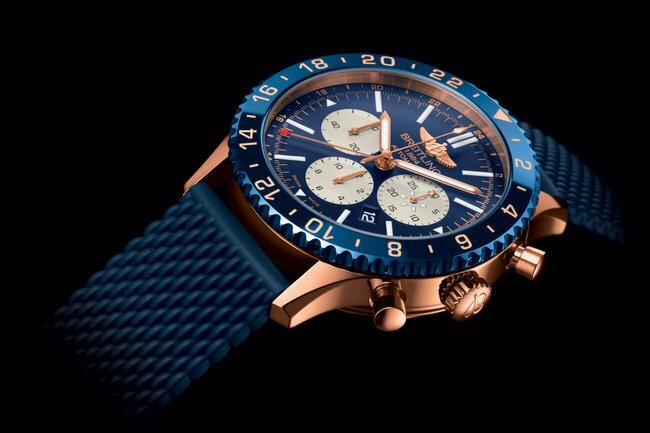 With such a vast array of timekeeping components, this aviation chronograph is equipped to travel the world. The complex caliber of the Breitling Chronoliner B04 offers multiple time zones and split-second timing. The complex functions of the Chonoliner B04 are housed within an elegant 18-karat rose gold case with an aurora blue dial and matching ceramic bezel. Striking rose gold and white colored markers on the dial and bezel complement the deep blue hues seen throughout the rest of the timepiece. In contrast, a red-tipped hand keeps track of the second timezone in 24-hour mode. Despite the noble metals used to craft this timepiece, the watch itself is quite durable. 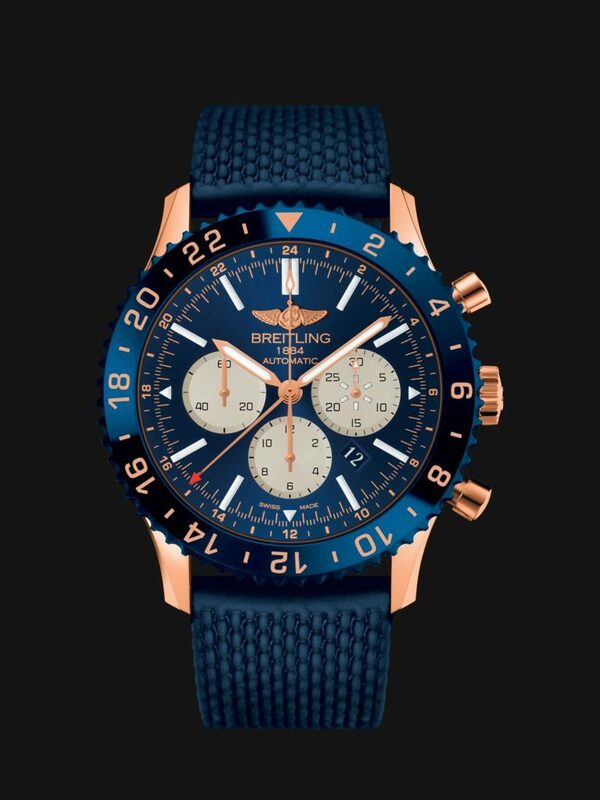 Water resistant to 100 meters, the Chronoliner B04 sits on a blue rubber aero-classic strap. Limited to just 250 pieces, the Chonoliner B04 is a truly exclusive chronograph designed to assist and equip those who travel the world. The watch retails for $32,545. Weight (without strap) 126.48 gr.